Home→SEARCHING→Searching – 80’s PLAYMATES PIXIE LULLABYE DOLLY -12 inch RED HAIR DOLL with a SOFT BLUE BODY – Pull String MUSIC!!! Searching – 80’s PLAYMATES PIXIE LULLABYE DOLLY -12 inch RED HAIR DOLL with a SOFT BLUE BODY – Pull String MUSIC!!! I am looking for this doll. 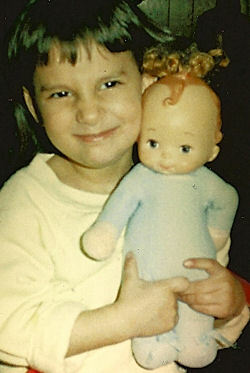 When I was a kid I destroyed the doll after I got in a fight with my sister, and I regret it very, very much. She called it Pixie, but I don’t remember if that was the brand name, or just a name she came up with. It had a blue, soft body and a hard head with red hair. Also…the name of the company is Playmates….100% sure….It also played music…100% sure on that. You could pull the string in back and music would play. I have been looking for this doll for so, so long, and she is getting married in July, and I would love to give it to her as a present. I know it’s a small chance, but I found you online and figured you guys look like the people to go to! I’ve already asked, but haven’t received an answer yet. I’ll add it to the post when Ray writes back. OMG I can’t believe you found that!! How do I get that?? Jeez Tami…amazing!! I can’t figure out if it is for sell, or sold. I sent an email to the people that run the site. We will see. At least we have a better idea of what to look for. There are several pixie playmates on ebay, but not the cloth ones. But some have the same face as the one you are looking for. Will keep an eye open for it. Sorry Ray, Daffydilly is just a reference site. That doll is not for sale. The pic has only been online for a couple of days. And I guess several people have gone there searching for you. A little confusing, in that I thought it was for sell, and not just a reference site. But they were helpful in contacting me right away. Thanks Tami!!! I appreciate the help!! I’m still on the search!! Hi I have one in pink and needs some cleaning. Are you still looking? You need to Contact Us, so I can put you in touch with Ray.